While it is typical for the mind to go straight to wedding anniversaries when the word anniversary is mentioned, in truth an anniversary is just a date that represents a special occasion or event that is important to the couple. That is why it is just as appropriate for non-married couples to celebrate anniversaries as it is for those who went through a marriage ceremony. Though it may not be common today, within the next 10 or 20 years it will be more common for non-married couples to be celebrating 50 years together. Although the celebration would not be called a golden wedding anniversary, it will be a golden anniversary all the same, and worth commemorating with gifts and a party. Though there may not have been a wedding ceremony and reception a couple who have been together in a committed relationship for 50 years deserves to be recognized as an inspiration to others. See the best gifts for the anniversary of your parents! The differences between celebrating an anniversary for a non-married couple and one who is married are very few and far between. The same ideas are appropriate for both married and non-married couples. The important thing is that the day is marked by some special outing and a gift if that is how the couple chooses to celebrate. Choosing which date is the one to be considered an anniversary takes a little bit more thought for a non-married couple. A married couple has the advantage of their anniversary being a year from the date of their wedding day. For a non-married couple, because there was no wedding, there are two common choices, the first being a year from the day they first started going out together. This can prove to be a little difficult if the couple is not in agreement about the day they first went out on an official date. Not being able to remember the exact day also may pose a bit of a problem. The second choice is often the most widely accepted, and that is the day the couple first begin living together in a committed relationship. This is as close to a wedding day as a non-married couple can get and is often a date that is easily remembered. Whichever date is chosen it is important to agree on that date and celebrate it each year of being together. One of the ways that some couples are choosing to declare their love for each other is through participating in a commitment ceremony. Much like a wedding guests are invited to watch the couple exchange vows and commitment rings, declaring their love for each other and their willingness to spend the rest of their lives together. While the ceremony and trappings may be less than that of a traditional wedding ceremony the commitment the couple make to each other is every bit as genuine and heartfelt as it would be if they were being married by a priest or minister in a church. Guests would be invited to join the happy couple on their commitment ceremony day, witness them declare their love for one another and then partake in a celebration afterwards. Gifts are typically given in much the same way as they are to a newlywed couple. 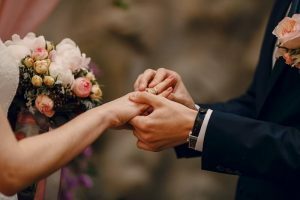 Many of the same traditions that apply to a wedding ceremony apply to a commitment ceremony, but where there are differences is that there is usually no change in surname and there are no legal papers to sign. Rings can be exchanged if the couple chooses to do so. A form of honeymoon is often taken afterwards for the couple to continue their own private celebration of their joining together in a committed relationship. Today it is not uncommon for non-married couples to have children together. For children it is important to see their parents celebrate their love for one another. In this way it reinforces the children’s own understanding of the love that caused them to be brought into the world in the first place. To young children the fact that their parents didn’t stand in a church and exchange vows, rings and then sign a marriage certificate is far less important than knowing that they are the product of a loving, committed relationship. 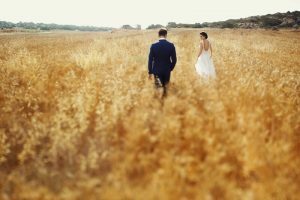 If questions arise as to the difference in surname a couple can explain to their children once they are of an appropriate age to understand, reinforcing that their love and commitment to one another is no less because they chose to not get married. Like many married couples non-married couples have lots of romantic ways to celebrate their years of living together. A quiet, romantic dinner for two at a favorite restaurant is usually a big hit, even if only because the couple has a chance to spend some quality time alone, away from the children and household demands. Exchanging carefully thought out gifts is another way to make the anniversary a special occasion. For anniversaries that celebrate specific years such as a silver or golden anniversary a more lavish celebration may be in order, and a renewal of their commitment vows is often undertaken on one or both of these dates. Check out the most speacial gifts for your next anniversary with your spouse now! For couples who are wondering what to get for their ‘significant other’ on their anniversary the same rules apply as for married couples. A silver anniversary, whether wed or not wed, is typically celebrated with a couple exchanging gifts of silver. If there is a party or get-together guests will typically bring gifts of either silver or silver-colored. The point is to celebrate the couple’s long and happy relationship in a way that means something to both the couple and to their guests. In today’s divorce-ridden world a couple who have managed to grow their relationship into one that has endured and will continue to endure, all the while providing each partner with the love, commitment, caring, understanding and friendship of the other is worthy of celebrating. An anniversary is a day that is just for the two people who love each other and have chosen to spend the rest of their lives together. Whether they choose to celebrate it alone or with family and friends is a personal choice. Either way an anniversary is cause for celebration.